Aston Martin Cygnet | What Car? It's been fewer than two years since the concept car version of the Cygnet appeared, but the production-ready version is here at the Geneva motor show. Based on the Toyota iQ, the Cygnet is for the Aston driver who commutes around urban areas but wants a bit of luxury while releasing a fraction of the pollutants into the air than they would in regular models. Both the White and Black trims have plush interiors, a cheeky face plus a bespoke five-piece luggage set. White models have white leather and Alcantara seats, chrome trim inside and out plus white paint, while the Black trim comes with you've guessed it black leather seats, chrome trim and a black paint job. 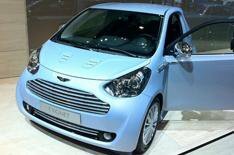 You can order your Cygnet from Aston Martin dealerships now, with a starting price of 30,995.